Thanks in part to modern popular culture, the story of the gladiator Spartacus and his revolt against the Roman Republic is widely known today, but perhaps the most surprising aspect is that it was two years before Rome was able to finally defeat the slave revolt, also known as the Third Servile War. Defeating a slave revolt brought no glory, so the job was given to local militias and lesser forces, all of whom were defeated by Spartacus as he roamed up and down Italy largely at will. By the time the Senate took the threat seriously and sent 10 legions, with more to follow, the Spartacus Army was well used to facing Roman forces in battle. As they stood waiting for the final battle to begin, however, they will have known that this was the full might of the Roman Army, not some poorly-led local force, and that their chances of success were much lower. A previous set depicting the army of Spartacus assumed the men were dressed as gladiators, when most of the army was made up of liberated slaves and others with little or no stake in society. Such men dressed like any poor Roman, but helped themselves to other clothing looted on their travels or obtained from the defeated Roman forces they came up against. We thought this set reflected that very well, with a wide variety of clothing. Many have the basic staple of a tunica, in this case with a belt, and one man wears just a belted kilt as was worn by many agricultural and mining workers. At least a couple have managed to obtain trousers - a non-Roman item (Romans considered them barbarian at this period) which might well reflect their ethnic background. Finally several have a cloak, a necessary item that herdsmen and others might well have brought with them when they joined as they regularly slept outside in the cold nights . Most recruits would have wanted some form of armour if possible, and plenty is on show here. Several have obtained a mail tunic such as was worn by the regular Roman soldiers, and so would be available in numbers after each victory by Spartacus. Less appealing but still better than nothing is the very old-fashioned pectoral, a small square plate of metal on the chest of one of these figures, while another has been very fortunate in obtaining a splendid muscle cuirass and greaves for both legs. Such well-supplied men would be very rare in the slave army, but not impossible. Half of the poses have acquired a helmet, mostly of the usual Montefortino type current at the time, although the man with the muscle cuirass (second row) has a much more elaborate one with a transverse crest, so clearly this man has robbed the body of an officer. The first figure in the top row wears an Attic helmet, a rare item anyway and so probably extremely rare in the Slave Army. The first priority for most recruits was to obtain a weapon. Those who would have a weapon anyway, such as herdsmen who had to defend their animals, would bring spears, slings and knives, but a large part of the army was probably slaves working in agriculture, who at best might bring some agricultural tool that could be used as a weapon, but would often be empty-handed. Once again defeated Romans and looted stores would be the best source of weapons, so here we find men wearing legionnaire swords and holding pila. One man holds a simple club, presumably for want of anything better, and another has an enormous hammer for the same reason. The first figure in the bottom row has an interesting bent sword, which is a Thracian pattern sometimes carried by gladiators themselves, so appropriate here, but the trident held by our friend with all the high-status armour is a weapon only found in the arena. As with the armour the quality of weaponry here is probably rather better than you would actually find in a random cross-section of the historical army, but nothing is actually incorrect. Things continue to look good when it comes to the equipment of these men. Many carry a shield, some of the standard oval army pattern of the first century BCE, plus a couple of small round ones and a square one that might even be home-made (the army was constantly trying to make what it lacked in supplies). One man has a gourd of water, but of particular interest is the man with the club in the third row, who seems to have a full panoply of centurion ornament, namely a phalerae or display of medallions on his chest – another looted item, and a strange choice as it would mean nothing except perhaps to suggest the new wearer wanted some authority, or just liked the look. 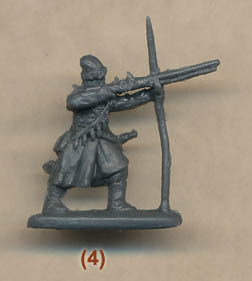 Strelets have made several ‘before battle’ sets and the choice of poses is relatively straight-forward. The figures are all standing and doing little, as you would when anticipating the start of a battle. While not in combat, several hold their swords unsheathed and at the ready, so clearly they expect action very soon. This sort of pose is fairly easy to do without producing flat or awkward figures, and all the poses here worked well in our view apart from the last figure in the third row, who holds his spear point down and at an angle, the reason for which is hard to understand. The standard of sculpting is at the good end of the Strelets spectrum. Detail is very good, and if at times a little too large it is much better than the chunky output of past years from this manufacturer. If some items are a bit indistinct then at least there is no assembly here, and we found almost no flash or excess plastic anywhere, so a nice clean production. The style is much better than the Spartacus sets that preceded this one, so these figures will work better with Romans from other manufacturers. We liked almost all the poses in this set, and while we can have no complaints about the accuracy of the individuals, we did feel that this set exaggerates the general level of armour and weaponry the army of Spartacus could call upon in a battle. Some of the simpler weapons such as the sharpened sticks can be fashioned from what is here, however, and perhaps many would prefer such an interesting collection even if it does not faithfully reflect the army as a whole. However the big positive of this set is that the box artwork, with its gladiator dress and equipment, has been completely ignored, for which we are very grateful.